Compgen Limited, a London based Innovative company, has scooped three major award for innovation for their innovative packaging closure device the patented Squeezeopen™ at the INPEX show in Pittsburgh, USA. The invention won two gold medals (Manufacturing and Novelties/Specialty Gifts categories) and went on to be the overall winner, picking up the 'Grand Prix Award'. 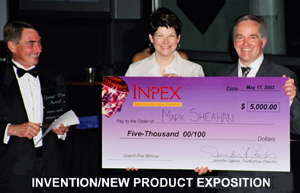 INPEX is America's largest trade show and inventors conference. The Squeezeopen™ was the only British entry from over 1,500 other inventions shown. Mark Sheahan (Managing Director of Compgen Ltd) developed the new design of packaging closure which he branded Squeezeopen™ after being frustrated with hearing the age old complaint of how people have problem opening containers that are currently available on the market. 'Consumers either have problems because the screw top lid has been put on too tight, the child proof locking system has locked the parent out or it is simply too complicated to open. This has led to many consumers taking a knife or scissors to the container which then incurs in a high percentage of injuries”. The patented Squeezeopen™ packs provide consumers with an alternative packaging solution. The technology comprises of a lid that is a press snap fit onto the base of the container. All the consumer needs to do is simply squeeze the side of the lid and the lid will pop off and what makes it even more special is that only one hand is needed!